The Beaujolais region produces a small ocean of wine. Most Beaujolais is red. Damned near all of it, in fact. Something like 99% of the wine produced in this region, south of Burgundy and Macon, north of the Rhone, is made from Gamay Noir. There is a tiny amount of white wine made here, typically of Chardonnay. The name Beaujolais derives from the house of Beaujeu, a name which appears in the mid-900s. The region, in addition to vineyards, gained fame in the 19th century as a commercial center of the textile industry. But it's the silky wines we are concerned with here. The vinification is a technique called "Carbonic Maceration." The region has insisted on hand-harvested fruit, but will, for the first time, allow mechanical picking with the 2000 harvest. The idea is to keep the fruit intact as much as possible. The grapes are then put into the fermentation tanks "whole" and un-crushed. Of course, the fruit at the bottom of a thousand-gallon tank will be crushed, but this, at the beginning, comprises something like 30% of the tank. In the middle and top are mostly whole clusters. The fermentation takes place and in so doing, the grapes pop (the fermentation creates alcohol and CO2). For Nouveau wines, the time "on the grape skins" is something like three or four days. For more "serious" Beaujolais wines, this maceration period may extend for little more than a week. The most basic, modest-quality wine is called simply "Beaujolais." This can come from any of the 23,000 acres which carpet the area. Typically, simple "Beaujolais" comes from vineyards outside the 10 "crus" (top villages where the wine takes merely the name of the village) or the other 39 "villages" which can be bottled as "Beaujolais-Villages" or be labeled Beaujolais-and the name of the specific village. From there, the top Beaujolais wines are sold by the name of their "cru" of which there used to be just nine. After a ten year period of "research," a tenth "cru" was elevated and anointed. That would be R�gni�. 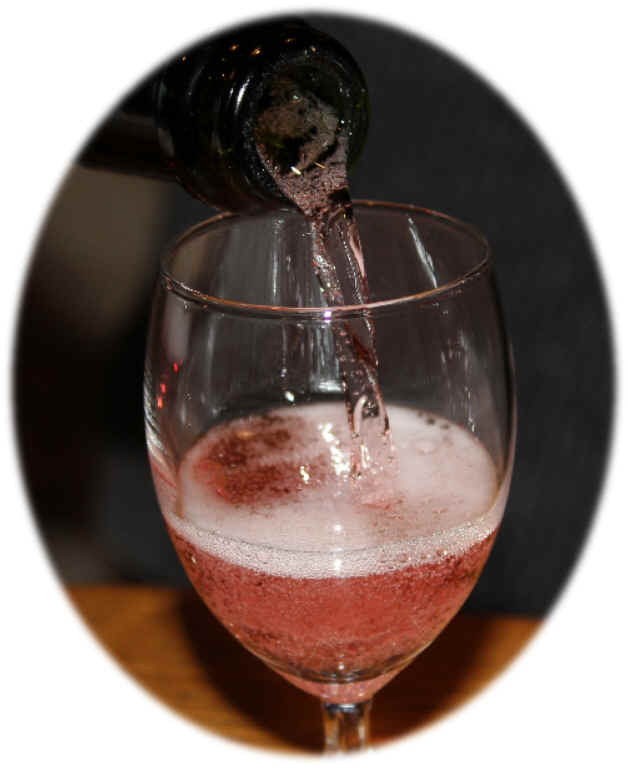 Beaujolais Nouveau is a particular type of Beaujolais with a short history. These wines, it seems, used to be sold simply as "Beaujolais Primeur." Alexis Lichine wrote that in his first book on French wines, these did not merit even a mention. "It was a young, fruity wine sold in barrels and served in carafes in restaurants in Lyon and in specialized bistros in Paris--strictly the cheap places. In the early 1950s, this vin nouveau never saw the inside of a bottle or traveled overseas. But at about that same time, by the strange workings of reverse snobbery, the news spread that it was chic to drink this newly born wine." Years ago this wine was offered for sale on November 15th, but a decade or so ago they changed the release date to the "third Thursday in November." This usually allows some extra days, not that the wine needs "aging." Beaujolais Nouveau has experienced a few ups and downs. It seemed like it was more popular about five years ago. We have purchased but a few of them and can't say they're much to our taste. Beaujolais-Nouveau costs less, typically, than "Beaujolais-Villages Nouveau." 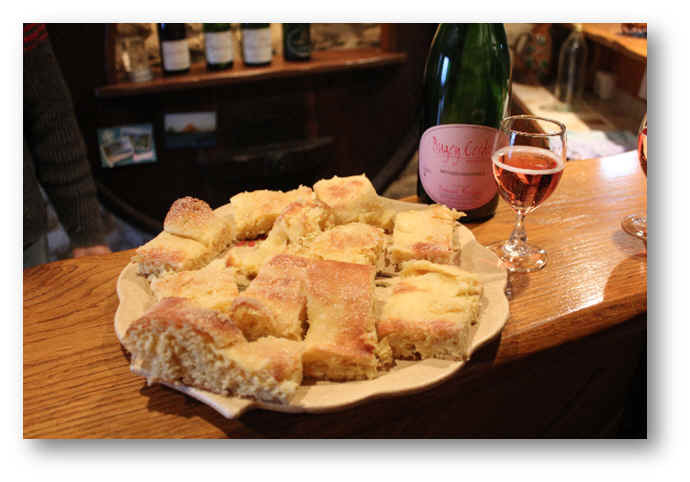 The world will really have gone to hell when you see "cru" Beaujolais making "nouveaux." They don't, at this time. My famous line is "Asking how the Beaujolais Nouveau are this year is like asking how the Pepsi is this week." One of the funniest incidents I can recall is a French woman arriving a day or two after the arrival of the Nouveaux wines. This was in 1998. "Where are the Nouveaux, Gerald?" she inquired. I pointed to the displays and she picked up a few bottles, looked at them and saw the vintage. "You have only the 1998?" she asked! Beaujolais is the next level of "quality." It can range all over the map, from pretty good to less-than-stellar. In the past 20 years they've planted many sites which weren't planted because the quality would be marginal. Of course, in the hands of a capable grower, you might find some drinkable wine. In the hands of knuckleheads, bonne chance! These wines, typically, require but a very modest sugar level at harvest-time. Growers can over-crop and then try to rectify their "mistakes" by adding sugar to the juice. Beaujolais-Villages is a higher designation, not only because the vineyard sites have historically produced higher quality fruit, but the potential alcohol content (related to the sugar content) at harvest must be a bit higher. The mere factor of riper fruit isn't a guarantee of quality, but it ain't a bad idea, either. This appellation accounts for 25% of the wine produced in Beaujolais. Recent stats show about one-third is sold as "nouveau." "Cru Beaujolais" are the wines from the ten best zones in Beaujolais. The funny little map at the top of this page shows some blue, teal, orange and green-hued areas. These are where the top "names" of Beaujolais come from. Curiously, these wines often are over-looked by consumers searching for Beaujolais. That's because the name of the "cru" is the only appellation to be found on the bottle. The word or "category" of Beaujolais is not mentioned! 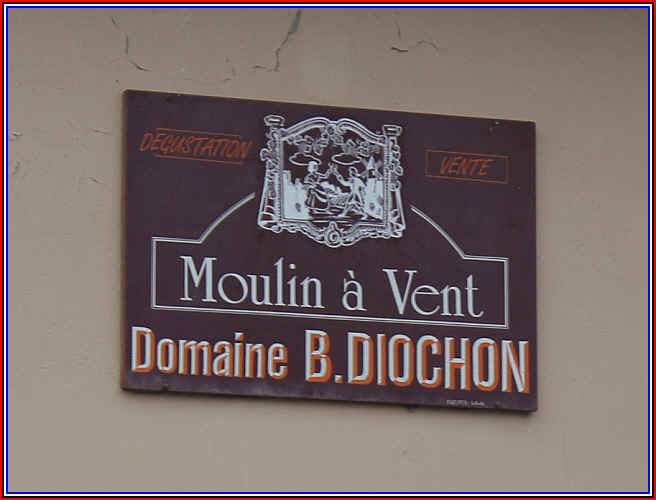 So, for example, someone wanting a top bottle from Beaujolais will overlook a wine labeled "Moulin-A-Vent" because it doesn't have the word "Beaujolais" anywhere on the bottle! Though these can be bottled as early as December following the harvest, most quality producers do not bottle these until, at least, after Easter. Some stay in large, rather neutral wood vats for an extended period of time. BROUILLY & C�TE de BROUILLY are the southernmost crus of the "heavy hitters." Just to the west of Belleville (north of Villefranche), Brouilly encompasses some 3,000 acres, while the C�te de Brouilly covers some 700. Brouilly is more sandy soil with some granite, with the C�te de Brouilly is predominantly granite. Up on the hill of the Mont de Brouilly you can kneel down and pray at Notre Dame du Raisin (Our Lady of The Grape == here at Weimax, Ellen is "our lady of the grape"). Every year in early September there's a service to pray for the coming harvest. SAINT AMOUR is the northernmost cru of the Beaujolais region and the perfect Valentine's Day accompaniment. It's a 680 acre appellation with granite, sand and clay. Some say there's a violety, almost floral note to the fragrance of good Saint Amour wines. Some people claim you can find a note of apricot fruit in these wines. CH�NAS is the smallest cru and is located adjacent to Moulin-a-Vent. Confusingly, the commune of Chenas lies within the area of Moulin--Vent! The wines with the Ch�nas appellation come from some 650 acres of vines on granitic soil. The wines are often a bit astringent right after bottling, but don't seem to last quite as long as Moulin--Vent. CHIROUBLES is just south of Fleurie and north of Morgon. These tend to be the most delicate and short-lived of the "Top Ten." The area covers some 850 acres and is the highest in elevation at about 400 meters. The soil is granite and porphyry. There's a monument of note in the town square at Chiroubles honoring one Victor Pulliat. During the phylloxera plague in the 1800s, he was the first to graft the French vines onto disease-resistant American roots. For that he is deserving of a toast, especially with a glass of Chiroubles! FLEURIE is said, by some, to be the main rival, quality-wise, to Moulin-A-Vent. This appellation is located south of Moulin-A-Vent and covers some 2,000 acres. Granite soil. Its wines are described as smelling of flowers, hence the name Fleurie. They tend to be a bit lighter and less tannic than the famed Moulin-A-Vent. JULI�NAS is north of Ch�nas and takes its name from Julius Caesar. You'll find 1450 acres of vines here on soil that's schist, clay and granite. These usually are at their best within a year or two of the vintage, but it depends of the particular producer and the harvest. 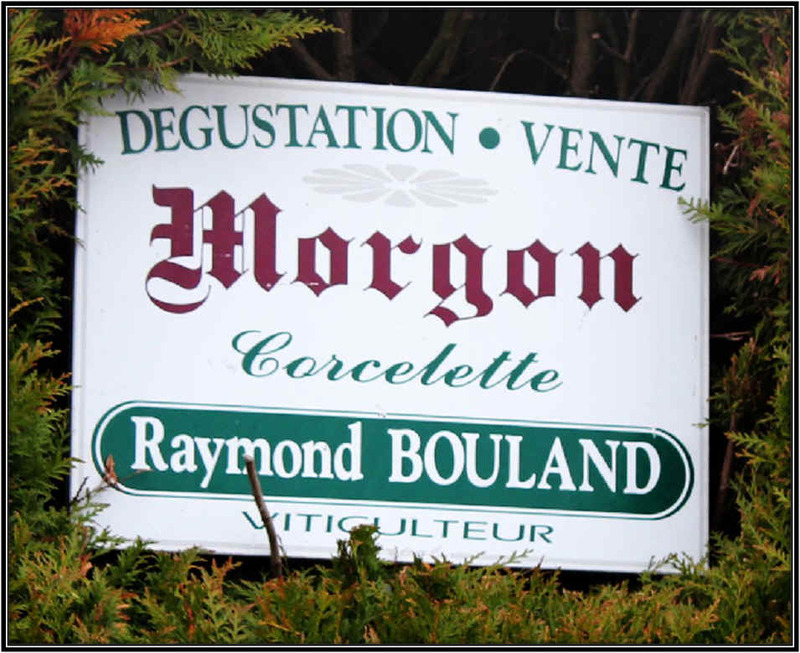 MORGON is north of Brouilly and its wines seem to vary from light and fruity to more deep and serious. The soil is a crumbly slate which the locals call roche pourrie (rotten rock). 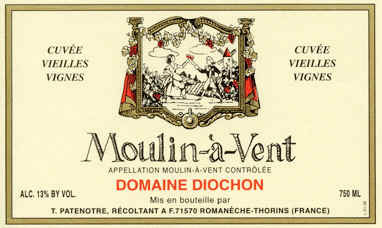 MOULIN-A-VENT is the most prestigious Beaujolais cru. 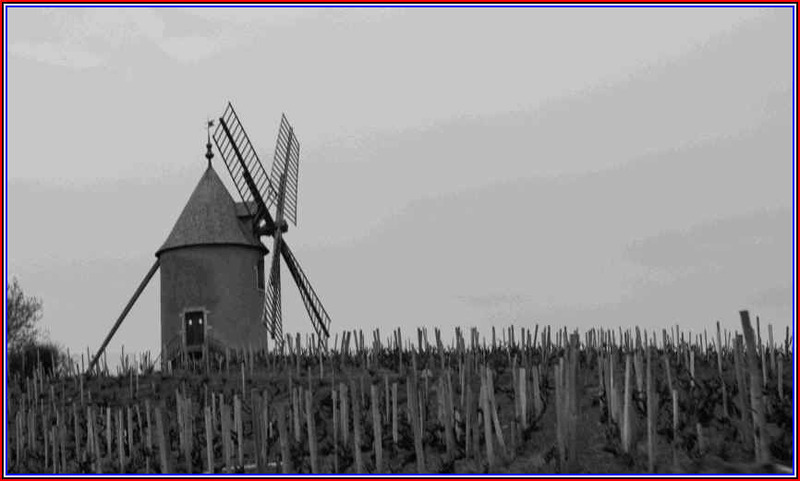 The name comes from an old windmill, somewhat of a symbol for Beaujolais in general and this cru in particular. These tend to be a bit fuller in body and sometimes have more astringency than other Beaujolais wines. The wines are said to be more "Burgundian" in style and with age, this is sometimes true. Some 1,600 acres comprise Moulin--Vent. The soil is granite with manganese (I tell you this in case there's a quiz or you're asked this by Regis Philbin on "Who The Hell Is Smart Enough to Be A Millionaire?"). REGNIE rounds out the Top Ten List. It's the newcomer, being elevated in 1988 after something like a ten year study. The region is west of Morgon and east of Beaujeu. Its wines can be quite good...less full than a Moulin-a-Vent or Morgon, but sturdier than a Brouilly, for example. We've had a top example from winemaker Jacky Gauthier...his seem to be routinely top class. 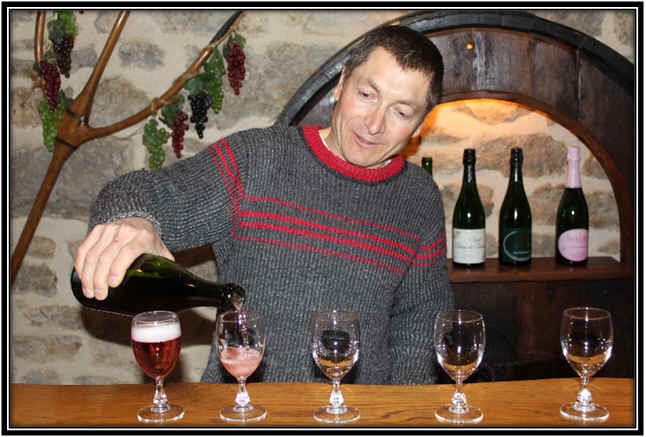 Years ago I was visiting Beaujolais and we had a stop in the village of Lantignie as there was a really good Beaujolais being imported by a local firm. This was in the days before Georges DuBoeuf was such a dynamo and we were treated to a taste of some older vintages...remarkable to see this usually frivolous wine could be cellared in some vintages with good results. About 20 years later I'm visiting the region again in search of the Domaine de Colette estate since we've been enjoying a couple of Beaujolais wines from this property. We're driving around the hill towns of Beaujolais and seeing the names of the top "cru" appellations and then, finally, we're at our destination. It's right across the street from the place I'd been in the early 1980s! The town is within the appellation of R�gni�, a site highly-regarded by Beaujolais merchants, despite the fact that it was not included in the original classification of "crus" back in 1935. 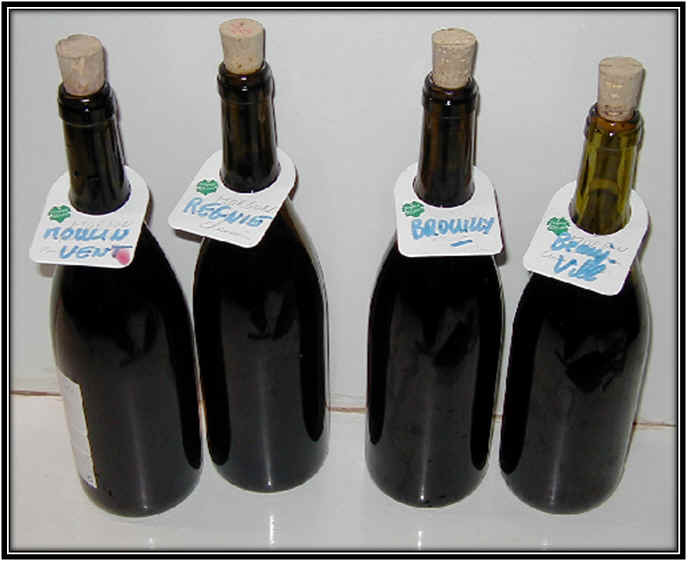 At that time, nine villages were tabbed as "cru" wines, allowed to label their production not as mere Beaujolais-Villages, but with the name of the specific 'village' on the bottle. It took a number of years for these 'seeds' to bear some fruit, but after the hot 1947 harvest, people started to pay a bit of attention to these precise appellation wines. R�gni� remained under-the-radar, though negociant firms such as DuBoeuf's routinely paid a modest premium for wines from this locale. In 1988 the R�gni� appellation took its place alongside its more famous neighbors as one of the top sites in Beaujolais. 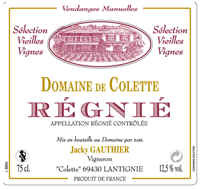 The Regnie cru in Beaujolais is predominantly sand and granite, though a small percentage of the region is clay soil. Though this winery is relatively new to us, they have rather old vineyards. The youngest are 50 years old, ranging up to 80 years of age! Jacky Gauthier and his wife Evelyne owns this small estate. I recall teasing them, some years ago, about Evelyne's father calling the winery and wondering why Jacky named the place after Colette. "Shouldn't it be called Domaine de Evelyne?" I asked. They explained the name Colette refers to the hilly vineyards, not some former girlfriend. "But does Evelyne's dad call every so often just to hear if you're answering the phone 'Domaine de Evelyne' or if the place is still called 'Colette'?" They think I'm "one bottle shy of a full case," I'm certain! Monsieur Gauthier is proud of their hand-harvesting of the vineyards (mechanical harvesting has yet to be approved for Beaujolais, though I'm not sure you could pick by machine in these hilly vineyards). This is noted on the label. This 2016 vintage of Regnie is delicious! It's a medium-bodied Gamay with some dark fruit notes...we don't find it as strawberryish as some vintages. Still, it's a good wine. We enjoyed a bottle with some roasted duck...a good pairing, actually. We also have their regular bottling of Beaujolais-Villages...just a shade lighter, but still fantastically fruity and delicious! A somewhat recent addition to the portfolio is the Fleurie. It's a lovely bottle of Beaujolais, but somewhat more 'serious' compared to the youthfully exuberant Regnie and Beaujolais Villages. The vines in Fleurie are about 50 years of age. Jacky gives the wine about 8 or 9 days of skin contact before pressing the juice away. Maybe 6 months in tank before bottling it and then it evolves in the bottle...the 2016 is quite good and teeming with fruit. Jacky Gauthier with his wife Evelyne and Pierre-Alexandre and his big sister, Amandine in 2006. 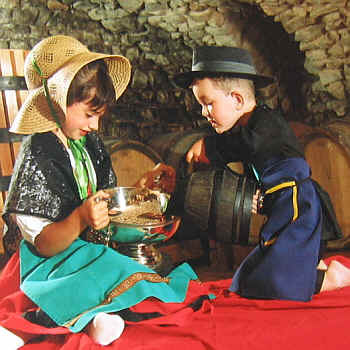 Here's a nice photo of the kids a few years ago...Mom and Dad had won a prize for the Beaujolais that year and here's little Pierre pouring wine for young Amandine. Morgon can be one of the most interesting of Beaujolais wines. There are numerous "Boulands" in the Beaujolais region. This fellow's brother, Daniel, is probably the most famous, but Raymond's wine is exceptional and arrives here with much less fanfare and a more reasonable price. Raymond & Denise Bouland have been in the Beaujolais business since the 1975 vintage. They have about 8 hectares of Gamay Noir, most in Morgon, but there's a tiny parcel in Fleurie, as well. This part of the family takes care of eight hectares of vineyards, most of them lying within the Morgon appellation. Raymond has a nice little cellar, but it's his brother who has the fermentation tanks and who vinifies the grapes. I think the 2014 is our twelth vintage from this little estate. It's exceptional for both its quality and reasonable price. Lots of strawberry notes and it's fairly deep on the palate. Yes...2002 Morgon...a totally different wine than the young, fruity Beaujolais we know and love so well. Then Raymond opened a seriously old bottle...a 1990 Morgon! That's our friend Jean-Marc Borsotti (he runs the Midas muffler shop and auto repair shop in Macon and he's a big fan of good wines) tasting the 1990 vintage. On a gray day in Moulin-a-Vent, close to the Diochon cellar. 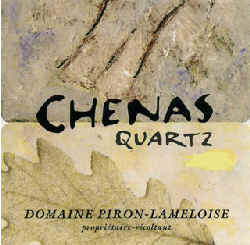 This is a small, old domaine which had been run by the Diochon family until 2007. Bernard Diochon sold the business to a fellow who'd been working for him for many years. 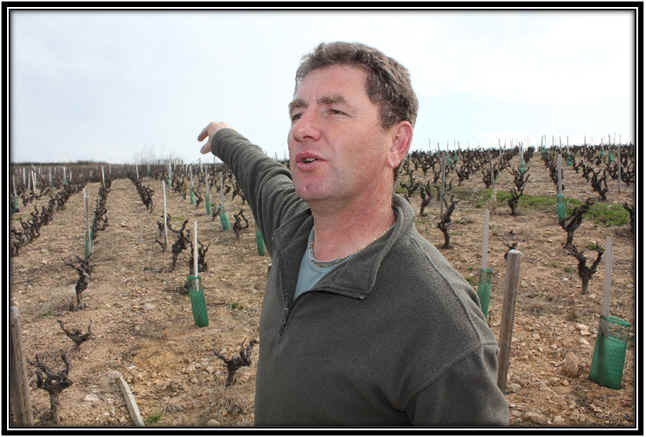 So, today Thomas Paten�tre, who also has another estate in Moulin-a-Vent, runs the domaine. The young vines on the estate are said to be 50 years old. The oldest parcels come close to the century mark. The fruit is hand harvested and they do not chaptalise the juice (no adding sugar). The whole clusters are tank fermented and they'll pump over a couple of times daily during the nearly two week fermentation period. The wine is then aged in large wood tanks for half a year, or so, before being bottled without fining or filtration. The 2017 shows some dark cherry fruit and a mildly earthy tone. It tastes like Beaujolais before they had electricity. Very nice now and it ought to continue to develop additional complexity with a few more years in the bottle. We like it. Dominique Piron has expanded his little empire in the Beaujolais region and today he farms something like 45 hectares of vineyards. He's viewed by most as a Morgon Meister, but Piron also does well with Regnie, Brouilly, Moulin-a-Vent and a special site in Ch�nas. Ch�nas is a tiny cru, so it's not nearly as well-known as Morgon or Moulin-a-Vent. It's also the highest elevation cru in Beaujolais. Piron knew the owners of a parcel in Ch�nas and he was dying to get his hands on the fruit. At the beginning he enlisted help from a friend who also made wine. These days the label has the name of a hugely famous restaurant/inn near Beaujolais, that of Lameloise. 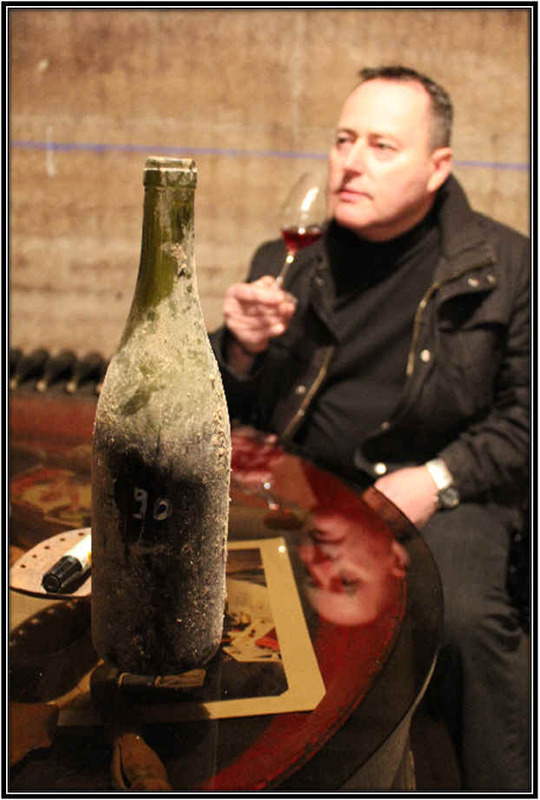 Piron's vineyards average about 50 years of age, one of the secrets in his making Beaujolais wines of such quality. We have the 2011 vintage of the Quartz in the shop presently...very charming! We typically find Chenas wines to be on the lighter side, but this one is a more substantial wine and, who knows? It may even grow a bit in the bottle. Cherries, red berries...a lightly floral tone...medium-bodied and thoroughly delicious. 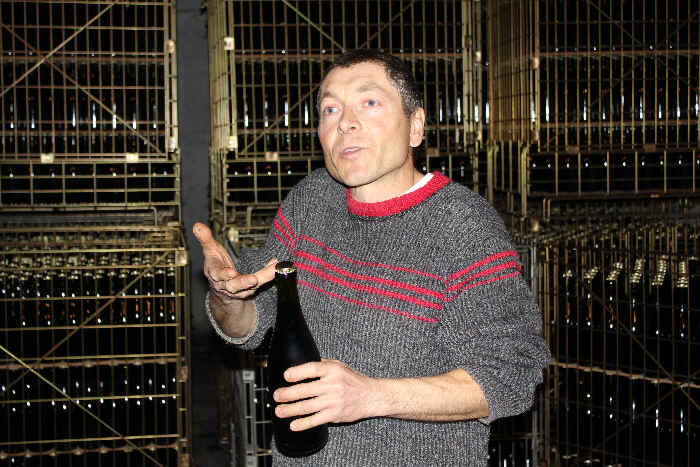 This guy is the King of Beaujolais for a reason. He sells something like thirty or so percent of the entire production from the region! He has a large winemaking facility, but also buys finished wine. They have a number of single domaine wines, as well. I read recently that King Georges sells something like 30-million bottles of Beaujolais annually! DuBoeuf is criticized by some for manipulating the wines too much. Some say DuBoeuf tailors the wines to the market. If a market prefers a wine of deeper color, DuBoeuf will oblige, for example. I don't know if this true, but the wines are big fruit bombs, typically. A few years ago the firm had some bad publicity when the fraud squad visited Duboeuf's winery and found some vats were not what they were supposed to be. Apparently some slacker of a cellar rat has blended some inferior Beaujolais into some tanks containing "cru" Beaujolais. Duboeuf explained that none of these wines actually were bottled, much less sold, so "no worries." More recently they were fined again by the government, this time for "enhancing" some batches of wine. I'd read one account claiming DuBoeuf's production manager was ameliorating some lesser appellations of wine with better quality blending material. This would, perhaps, make Duboeuf's wine more intense or deeper than the same appellation wines from his competitors. The firm was fined again, though the Beaujolais growers' association has publicly defended Duboeuf. We had one of their cru Beaujolais wines in a blind-tasting in January of 2007. This was a perfectly lovely wine, reminding me of a Beaujolais-styled Zinfandel a California winery made many years ago. It was darker than the other wines in the tasting and it showed more blackberry notes than typical strawberryish Gamay aromas and flavors. I could actually sense the wine was fussed with to make it more attractive to certain segments of the market. And it did appeal to some tasters. With the 2009 vintage, we included two domaine bottled wines. Both were really good. And they were a far cry from the soda-pop bottlings of Nouveau Beaujolais one sees from DuBoeuf every November. Currently we have a domaine bottling in the shop. It's from the 2009 Juli�nas cru and the Chateau des Capitans, specifically. The property was some sort of Roman outpost, it's said, and officers were quartered there, hence the name "Capitan." This is a delicious Beaujolais...not a fruit basket, but deeply berryish and teeming with red fruits. 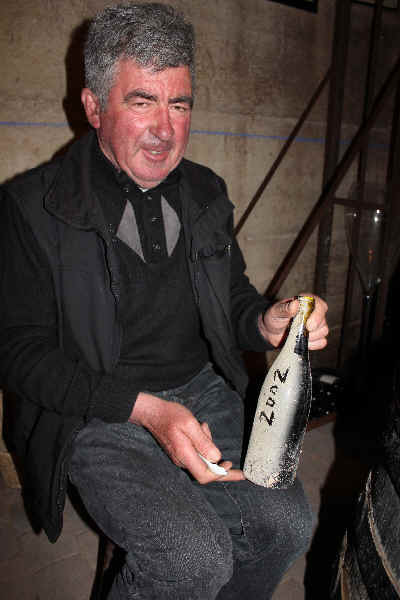 At one point the property belonged to a major Beaujolais luminary, Victor Peyret. Victor, it seems, was a major ambassador of the wines from Juli�nas back in the 1940s and 1950s. He and another fellow would invite Parisian journalists, artists and performers to come visit. Once there, the guests would be filled with copious quantities of the locally-made Beaujolais as they were wined and dined to excess. 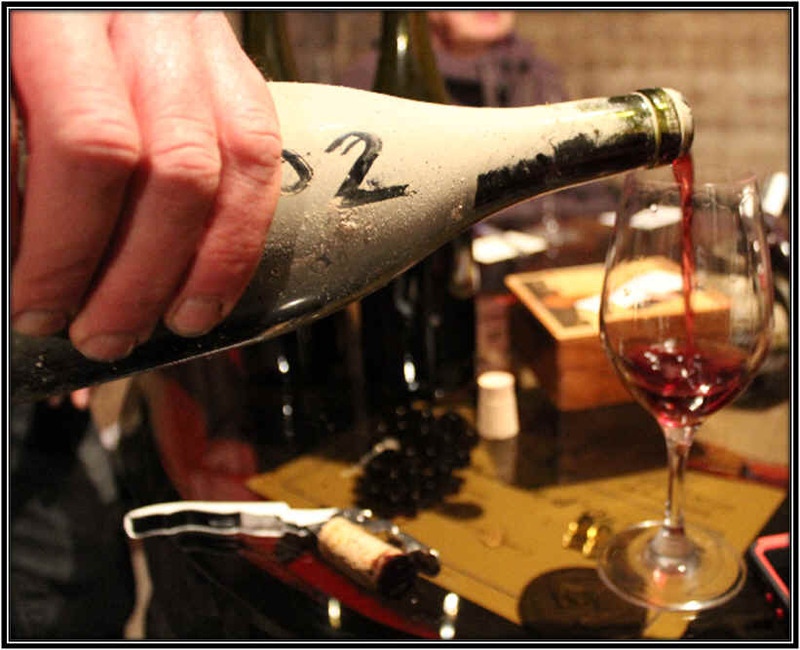 As a result, Juli�nas, in particular, became "the" favorite red wine of Parisians during this period. Peyret is so esteemed, by the way, there's even a "Victor Peyret Award" which is given to someone who, like Peyret, does a lot to publicize or promote the wines of Juli�nas! The Lapierre estate is quite famous amongst those proponents of organic farming and minimal interventionist winemaking. The family owns eleven hectares of Gamay vines and a small parcel is cultivated biodynamically and the rest is farmed organically. They've been doing this for several decades, one reason they're so revered in the winemaking community. They've added a few more hectares of rented vineyards which they also farm. The stated goal of the Lapierres is to work with "grape juice." They don't add sulphur to the juice nor do they add yeast to ferment it. They do not chaptalise either (add sugar to the juice). No pump overs during fermentation and no punch-downs. Minimalist. When the wine is nearly finished fermenting, the Lapierres transfer it to seasoned oak barrels where it finishes its primary fermentation and where it undergoes its secondary fermentation. The wine is then typically matured in wood for 9 months and at this point, still no SO2. They offer their importers the option of adding a small dose of sulphur at bottling to preserve the wine. Filtration is another option. The Bay Area importer says their bottling is unfiltered and sans soufre (non-sulfited). 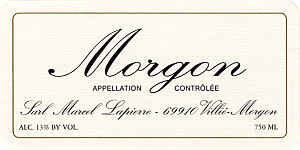 While some wine writers trumpet the virtues of this sort of enological philosophy, we can't say the wine is "superior" to others from Morgon, but it is distinctive and different and there is a particular character here. Well worth trying, but you may find this to be different from today's typical fruit-basket wines from Beaujolais. Probably one of the biggest surprises is finding a wine from Jadot which we liked. In organizing a blind-tasting of Beaujolais wines, I splurged and bought a bottle of a wine from an estate we'd known back in the 1970s...Chateau des Jacques was a special wine in those days and for the sake of nostalgia, I decided to see what Jadot is doing with the property. They bought the estate in the mid-1990s. It's a large property, comprising more than 60 acres of Gamay vines. 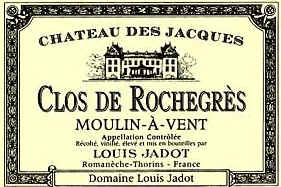 There are 5 enclosed vineyard parcels, Clos de Rochegr�s being a 20 acre site situated in Moulin-A-Vent, close to Fleurie. The 2009 won our blind-tasting, though it is hardly a classic example of exuberantly fruity, carefree Beaujolais. The reason for this lies in the vinification: the wine was not traditionally fermented along the lines of Beaujolais. Instead, they did a Burgundian vinification and produced a wine far more "serious" than simple Beaujolais. Aging in a variety of French oak barrels adds a mildly woodsy note to the wine. This wine merits a term one rarely ascribes to Beaujolais wines: complexity. And with this "serious" quality comes a serious price tag. Despite its elevated price for a Beaujolais, the wine is actually reasonably priced for its quality. 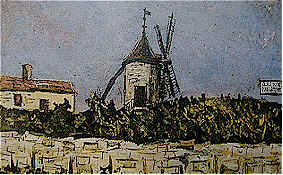 The wines of Moulin-a-Vent are said to be cellar-worthy. We have note tasted a more age-worthy bottling than this. 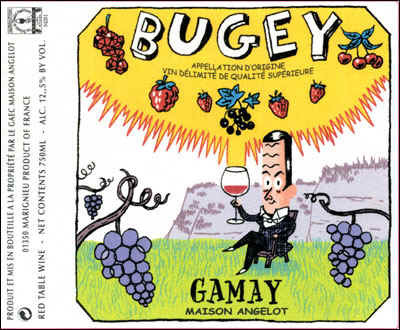 I don't think anyone has ever asked us for a wine from the appellation of Bugey. The region is rather obscure, being located in the Savoie region of France, east of Lyon and west of Geneva, Switzerland. Well, finally we can claim to have some Savoie fare here with the arrival of this wine from Maison Angelot. 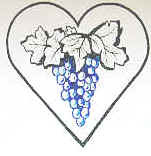 The primary red grapes are Mondeuse and Gamay, though they also grow Poulsard and Pinot Noir. The major white grape is something called Chardonnay, though I haven't tasted one that's reminiscent of the wines from Burgundy. The Angelot brothers have about 57 acres of vines, split amongst numerous parcels and various grape varieties. About four hectares' worth of Gamay produces this wine. Their Gamay wine is much like the sort of Beaujolais one would find in a good French restaurant, served by the carafe. It is delightful served lightly chilled as an accompaniment to chicken or other white meats. The 2009 is as good as most Beaujolais-Villages wines, by the way. 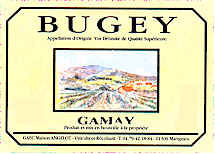 The residents of Bugey (they are not called "Buggers," incidentally) also like this wine with Raclette, fondue or an assortment of charcuterie. That's a label which stands out in the shop! Most people are attracted to it and the wine sells reasonably well and it's well-priced. The new label, designed by a French fellow who draws "posters" and advertising art work. The San Francisco importer asked the artist to submit a possible label drawing using some ideas supplied by the importer. When our friend and wine importer Charles Neal mentioned bringing over a curious wine from the French Alps that was made from Gamay and bubbly like an Italian spumante and sweet and pink we figured the poor fellow was out of his mind. 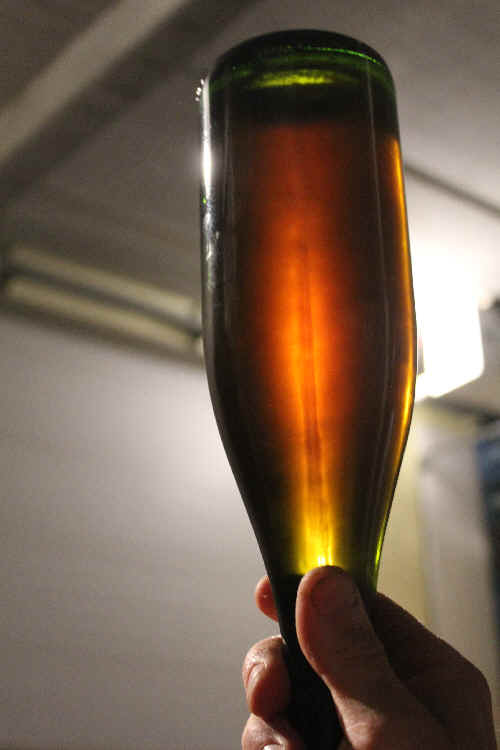 A bottle of Rondeau's wine "in progress."